Dave Norton during Prologue set in 2004. 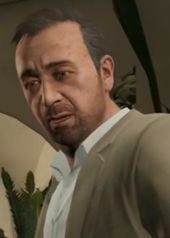 David "Dave" Norton is a character HD Universe appearing in Grand Theft Auto V as a major supporting character. Unlike his superior, Agent Norton is portrayed as reasonable and polite, despite his corruption. He tries to keep the protagonists safe whenever they are roped into Agent Haines' schemes. Agent Norton also does not condone torture or unnecessary civilian causalities. This page was last modified on 15 March 2015, at 04:21.